When throwing a shindig in today’s fast-paced and modern world, it can be hard to keep up with the latest popular trends and customs. Of course, when friends and family realize you have your very own home bar, they’re sure to get excited whenever they receive an invitation to one of your soirees. In order to really impress your guests, there are a few key ingredients the perfect home bar should ideally contain. After all, why just meet your guest’s expectations when you can blow them out of the water? 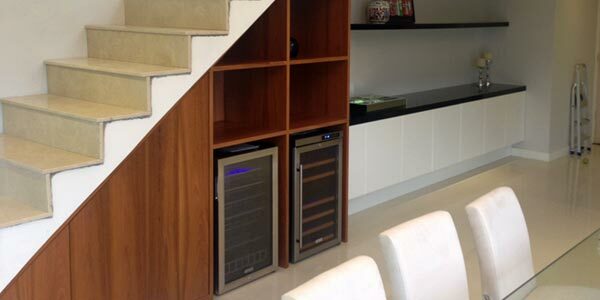 Obviously no home bar is complete without a stylish wine rack, whether freestanding or wall mounted. Your choice in this area no doubt depends on your collection and the general aesthetic you’re trying to achieve. Regardless of the makeup of your collection however, a wine cooler — either stand alone or built in — can really tie the room (and party) together. It doesn’t really matter the make-up of your home bar; there will definitely be a wine cooler out there that suits your wants and needs. 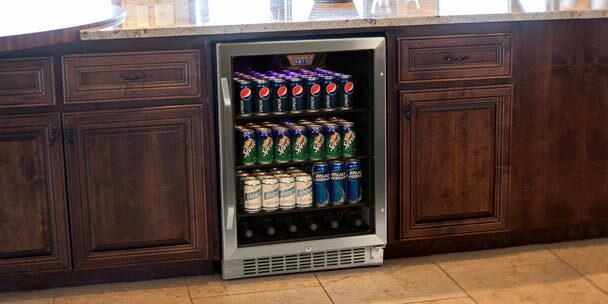 Whether you’re looking for a smaller, trimmer model that fits a couple of dozen bottles, or a larger cooler that can hold uphold upwards of 80 bottles, there is sure to be a unit out there for your dream bar. Many models even feature dual-zone cooling, which is a must for the enthusiast that entertains. With multiple zone cooling you can store a Chardonnay and a Pinot Noir in the same cooling unit yet have both wines sit at the ideal temperature. Of course, not every partygoer is keen on wine. A general beverage refrigerator is another savvy investment for those wishing to maximize the potential of their home bar. Beverage refrigerators are definitely a must-have appliance for every home bar. These useful units can be found as freestanding models in a range of different sizes. Even small compact models can fit as much as 60 (12 oz) cans or 30 (20 oz) bottles. And just like the wine coolers, you can even get a built-in model to place directly into your home bar. There are a variety of different beverage refrigerators to suit your needs. You can find dual-zone units that allow some areas of your refrigerator to be cooler than others. 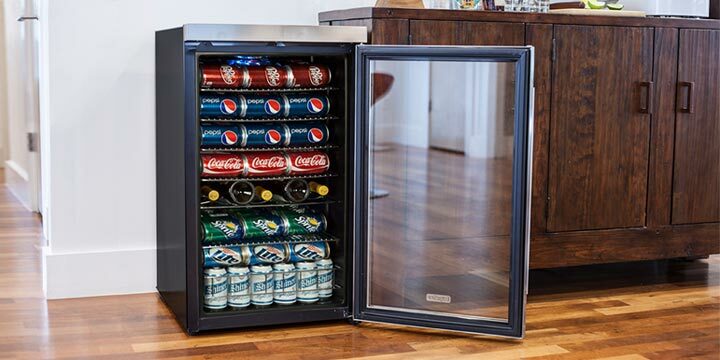 This is a great option for those who know they’ll be storing a variety of beers and sodas, and then another type of beverage that will require a much different temperature setting, such as wine or certain types of liquor. The ice maker is one of those appliances that unfortunately gets overlooked sometimes when one is putting together their home bar. 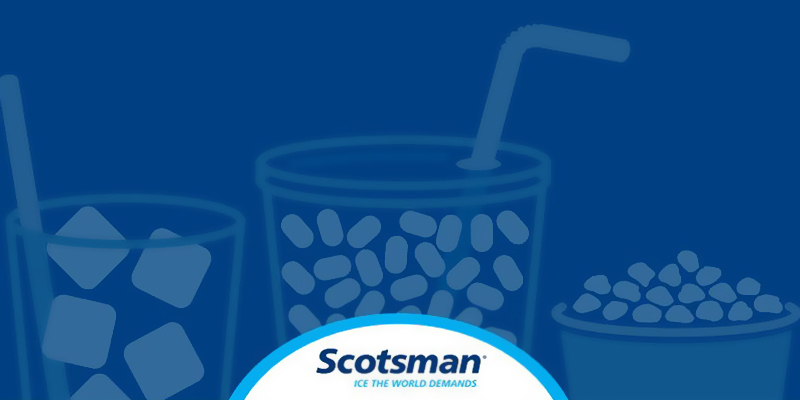 Remember though that any bar or restaurant you frequent will definitely have a professional, commercial ice maker. With that in mind, when talking about constructing the ultimate personal home bar, how could you neglect such a key element that is the ice maker? Whether freestanding or built-in, this appliance is one you will never regret purchasing. The convenience alone is worth the purchase. Keep in mind all the money and time you’ll save by not having to frequent the grocery store to purchase heavy, unwieldy bags of impossibly hard ice and this appliance becomes a no-brainer. Some units even come equipped with timers and alarms to alert you when your ice bin is full or not working properly. If you’re limited on space in your home bar, or if you just like taking your party on the road, a portable ice maker is exactly what you’re looking for. 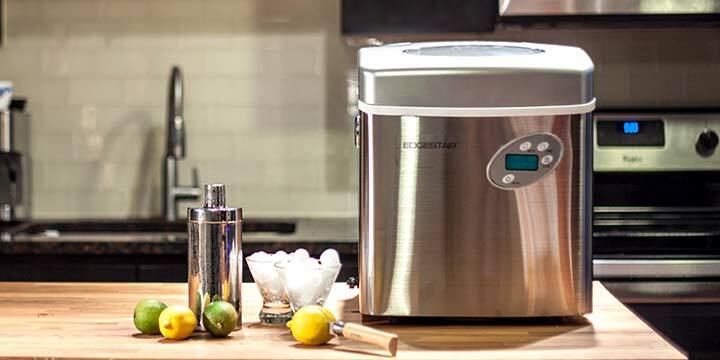 Durable, quiet, and efficient, this size of this ice maker can make rocks for your drinks in almost any situation or locale. Bottles and cans of beer are all well and good, but when you’re trying to maximize your personal bars’ potential, you will certainly need a quality kegerator. Whether you just want a single tap model to keep you and your friends’ favorite beer on hand, or you want to go all out with a triple tap unit in order to keep multiple brews in stock at once, this appliance is a must for those attempting to achieve home bar perfection. A kegerator will also refrigerate your brew, keeping it around the ideal 34 degree temperature you and your drinking buddies are so accustomed to getting at your favorite local bar. Whether you’re a casual beer drinker or a hops connoisseur, your home bar would hardly be considered complete without a kegerator. Remember to browse the units on the market today to find the type that will most complement your bar. You can find under-counter kegerators, freestanding kegerators, and even outdoor models. When it comes to variety and customization the number of options are staggering. 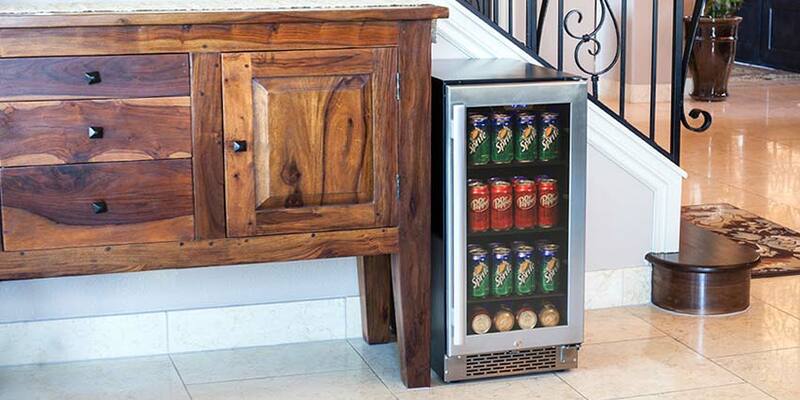 The mini-fridge is essentially the cherry on top of your dream home bar. These units are often efficient both space- and energy-wise and can refrigerate a variety of beverages and foods. Many models even have a small freezer attached as well. The ultimate home bar can fully utilize the mini fridge as means to separate your food and beverages. Beer and wine aficionados alike can attest to the fact that containers of food can alter the taste of your alcohol and vice versa. Utilize the freezer of your mini fridge for liquor and spirits, and the main refrigeration sections for fruit garnishes, snacks, and miscellaneous beers and wine coolers. One of the most appealing features of the mini fridge that separates it from wine coolers is the easy-to-clean nature of the appliance. For instance, many models have flat, one-piece interiors that make clean up and upkeep simple and quick. Hi Shane, i would love to buy the ‘Beverage Refrigerator’ for stocking beer bottles and other beverages. 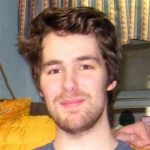 Do you recommend any brand specifically?